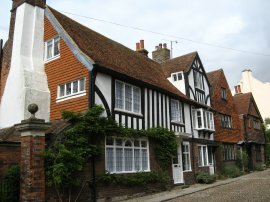 I did this walk on Sunday 6th September 2009, driving to Rye from where I took the train over to Ham Street. 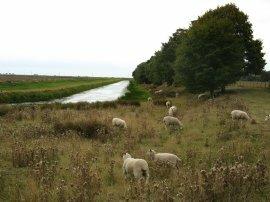 Unlike my two previous circular walks along the Royal Military Canal Path this walk followed a fairly direct linear route along the canal back to Rye. From Ham Street it was just over a mile and a half back to Warehorne Bridge to resume my walk along the canal. Leaving Ham Street station I headed down Ashford Road and crossed over B2067 Warehorne Road into The Street. At the road junction I spotted a very small plaque commemorating the start, or finish, of the Greensand Way, a walk I think I will be doing in the near future. 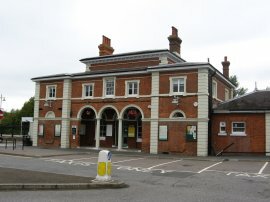 I have in the past walked the Kent section from Sevenoaks but never done the complete route to Farnham. A short distance down The Street I joined a footpath on the right that headed past houses and a playing field out into open fields on the edge of Romney Marsh. 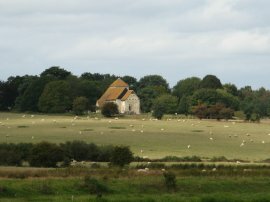 There were good views over to my left across the marshes as I headed over fields, which I think had been planted with linseed, photo 1. 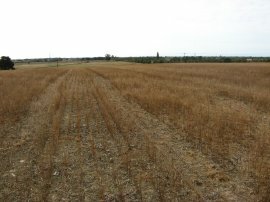 The crop had been harvested but there were quite a number of small seeds lying on the ground indicating what had been growing there. 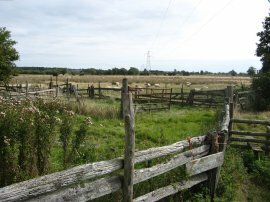 The footpath heads over the A2070 and then continues along a rather indistinct path that heads over a marshy patch of ground towards a small set of rather old sheep pens, photo 2. Having negotiated a way through these the route then headed diagonally across a grassy field to join the Royal Military Canal path at Warehorne Bridge. 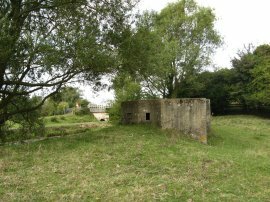 Back on the walk proper I headed down the canal and past an old concrete pill box, one of many that line the canal side path, photo 3. 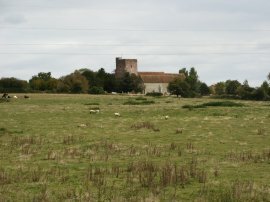 A short distance further on the route passes under a rail bridge, photo 4, which I had earlier crossed over on the way to Ham Street from where there were views up to Warhorne Church on the right, photo 5, yet another of the many churches that nestle on the slightly higher ground that runs to the right of the canal. It was a slightly overcast day, although the clouds never became very thick, and reasonably warm with only a slight breeze which made for quite pleasant walking along grass covered the canal side path, photo 6. 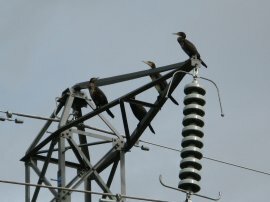 For a while the path runs besides some electricity pylons and on one of these there were a number of cormorants perched, surveying the landscape from high up above the path, photo 7. 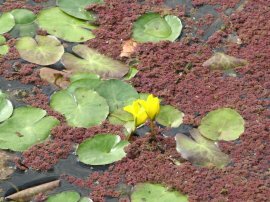 Down on the canal there were several large patches of water lilies, some with the occasional yellow flower, as well as a considerable amount of a small reddish plant the was floating on the surface of the water, photo 8. 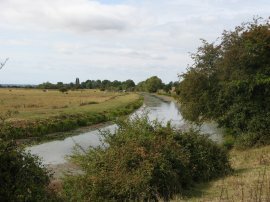 Surprisingly close to Warehorne the canal passes below the Kenardington Church, photo 9, before reaching the first road bridge of the day over the canal. 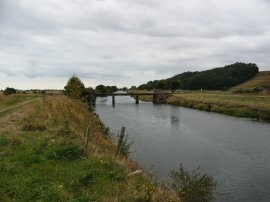 While stage two of the walk had been characterised by the number of roads crossing over the canal I was only going to cross one more road over the canal on the remaining 7 or 8 miles to Rye. From the bridge it was a 2 mile walk along a broad tree lined section of path besides the canal bank to Appledore. 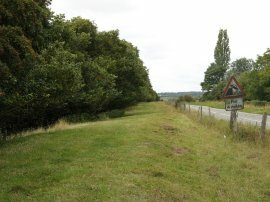 This stretch of path, like the one from Warehorne is managed by the National Trust. Approaching Appledore I was able to spot the route of the Saxon Shore Way on my right which runs along the horizon of photo 10, and I remembered stopping to photograph the two trees on the slight mound in the middle of the photo. 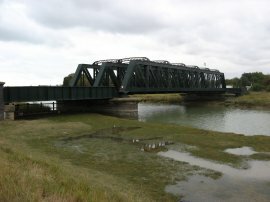 I stopped for a short break just outside Appledore before crossing over the final road before Rye and continuing on alongside the canal along a narrower section of path with a road running to my right, photo 11. Parts of this section of path were being grazed by sheep and there were a succession of small temporary gateways, splitting the sheep into different groups, to pass through. 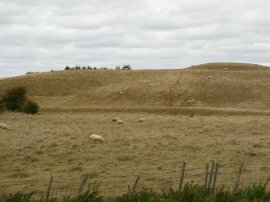 Looking across the road on the right I was struck by how dry and yellow the grass was looking on the low hills the rose above the marshland, photo 12. While the middle of summer had been quite grey and dull the last few weeks had been quite dry and in some areas it was starting to show. 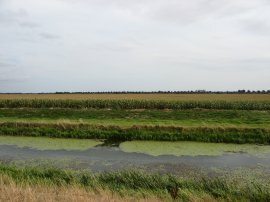 To the left of the canal was the flat open fields of Romney Marsh, some being grazed, others containing crops, photo 14. 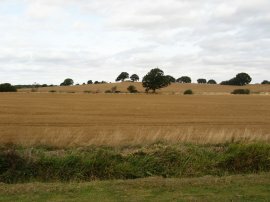 The hills on the right eventually recede as the route begins to cross over the valley of the River Rother and a little further down the path the canal crosses over the boundary from Kent into Sussex, the site of the boundary being marked by a small stone column, photo 15. 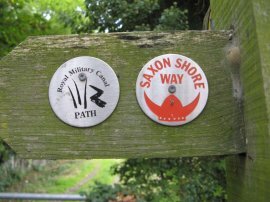 Not far past the county boundary the route of the royal Military Canal Path is joined from the right by the Saxon Shore Way, the two paths sharing their routes from here to the end of the canal at Cliff End. 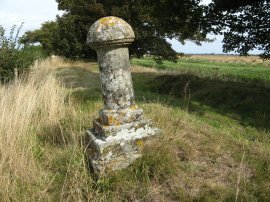 Reaching this point meant that I had now walked the entire route of the path, having walked the Saxon Shore Way a couple of years ago. 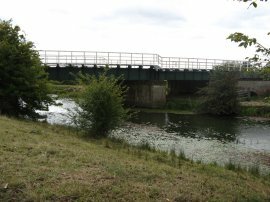 From this point it is only a short walk down to Iden Lock which marks the junction of the Royal Military Canal and the River Rother, photo 17. 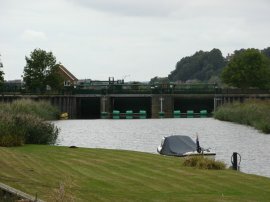 Just before Iden Lock is reached the route joins the road for a short distance before crossing over the end of the lock, photo 18, to join the other bank of the canal. 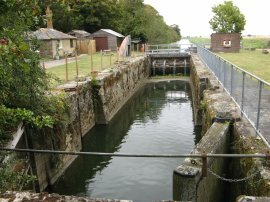 Iden Lock, which was built in 1808, has now been turned into a sluice and no longer functions as a lock although the old lock gates remain in place at the river end of the lock, photo 19. Below the lock the nature of the path changes with path running besides open fields next to the river, photo 20. 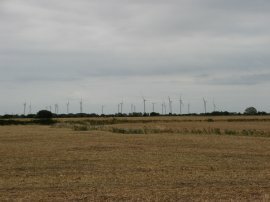 In the distance to my left were the turbines of the Camber Wind farm which had not been in place when I walked the Saxon Shore Way. The path continues alongside the river for about a mile, passing through a rather forlorn area of caravans lining the bank, to reach Scotts Float Sluice, photo 22. 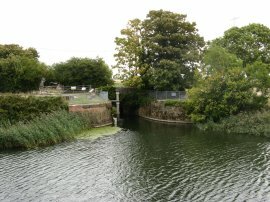 The sluice marks the tidal limit of the River Rother and its three metal barriers were raised creating a considerable difference in the height of the water on either side of the barrier. 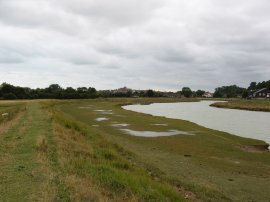 Last time I had walked here the tide had been out exposing large mudbanks alongside the river channel however on this occasion the tide was in and the channel full of water, photo 23, as I made my way along the slightly raised floodbanks towards Rye which was growing ever nearer in front of me, photo 24. The path follows the flood embankment round under the railway bridge which I had passed over earlier in the day on my way to Hamstreet and continues on to join the A259, using the road bridge to cross back over the River Rother. 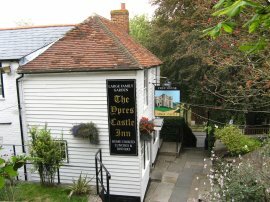 Once over the river the path heads to the left alongside some playing fields before crossing the main road again and taking a flight of steps up past the Ypres Castle Inn, photo 27, into the centre of Rye. 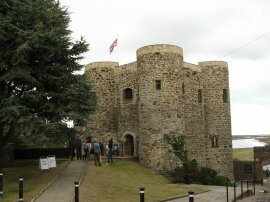 At the top of the steps the path passes the Ypres Tower, photo 28, and heads into Church Square, opposite the Church of St Mary the Virgin, photo 29. 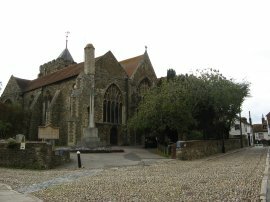 For a small fee it is possible to climb up the bell tower of the church which has a narrow viewing platform running around the base of the church spire giving excellent views across the surrounding countryside. 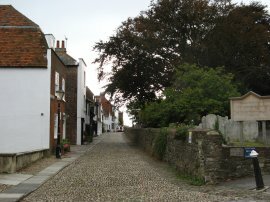 I then headed along the left hand edge of Church Square, photo 30, which leads into Watchbell Street. 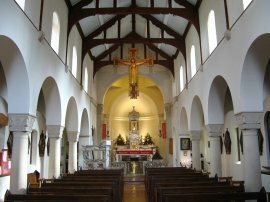 On Watchbell Street I paid a quick visit to the very attractively designed St Anthony of Padua Roman Catholic Church, photo 31. 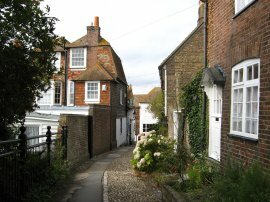 At the end of street, photo 32, the path turns right down Traders Passage, photo 33 which runs down to the Mermaid Street. Turning left the route heads down Mermaid Street and along the Deals, back down to the main road and River Tilingham. 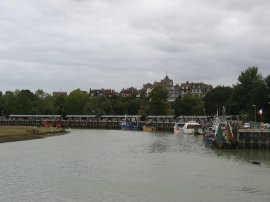 Here the Royal Military Canal Path heads to the right and takes the road bridge over the river, however I headed off to the right along Wish Street to make my way back to Rye station. Reaching the station, photo 34, I had walked 12.2 miles of which 10.3 had been along the route of the Canal path. This had been a very easy and straightforward walk through an area I know well. 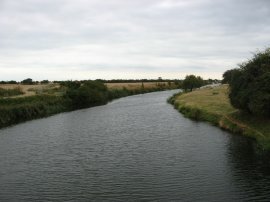 I now only have five or so miles to walk to reach the end of the canal, all of which follows the route of the Saxon Shore Way. 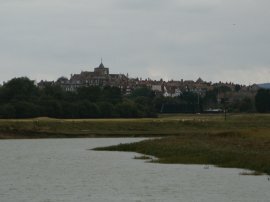 View over Rye from Tim Bertuchi on Vimeo.